BAILLIE, Sir FRANK WILTON, financier and industrialist; b. 9 Aug. 1875 in Toronto, son of John Baillie, a merchant, and Marion Wilton; m. there 8 June 1900 Edith Julia White, and they had three sons and two daughters; d. there 2 Jan. 1921. Of Scottish-English parentage, Frank Baillie was educated in Toronto’s public schools and began working about 1889 as a clerk with the Central Canada Loan and Savings Company, which by the 1890s was shifting its business from mortgage lending to bond dealing and underwriting. 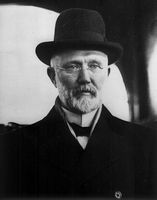 As private secretary to and a protégé of the company’s founder, George Albertus Cox*, Baillie benefited from his employer’s status as one of the country’s most powerful financiers. He was made Central Canada’s accountant in 1896, two years later its secretary, and in 1901 assistant manager. By this time his brother James W. had also joined the Cox network: he and Cox’s son Herbert Coplin managed the eastern Ontario branch of the Canada Life Assurance Company. In addition to his work with Central Canada, in 1901 Frank became managing director of its new subsidiary, Dominion Securities Corporation, chartered to carry on bond trading. He must have impressed others within the Cox empire. When Cox’s son-in-law and business associate Alfred Ernest Ames* decided to distance himself somewhat from the network and organized the Metropolitan Bank in 1902, Baillie, then in his mid twenties, became its general manager, reputedly the youngest man in Canadian history to run a chartered bank. Banking evidently gave too little scope for Baillie’s ambitions, however, and in 1903 he resigned to start up, with his brother and Frank Porter Wood, a brokerage firm, Baillie Brothers and Company (later Baillie, Wood, and Croft), which operated on the Toronto Stock Exchange. By this point, trading was expanding into new business sectors, especially resource development and manufacturing, spearheaded by a new generation of brokers, including Ames, Edward Rogers Wood* (Frank’s brother and another Cox associate), Frederick Herbert Deacon, and William Maxwell Aitken*, who not only channelled investors’ capital but also invested heavily themselves. Baillie prospered by putting his own money into the Cox group’s transportation, utilities, and manufacturing projects, including the Dominion Coal Company Limited, out of which he earned a great deal of money. (At his death his estate would be worth more than two million dollars.) In 1912 he formed the Bankers’ Bond Company Limited to succeed Baillie, Wood, and Croft. As the Cox empire came under increasing criticism, Baillie had begun to strike out on his own as an industrialist. In 1910 he mobilized Toronto capital to create the Canada Steel Company Limited (renamed Burlington Steel in 1914), a large, specialized operation in Hamilton that employed about 300 men to roll bar products from scrap rails – the only such plant in Canada at the time. Baillie would be its president until his death. He also helped bring together Canadian capitalists and Clifton William Sherman*, the manager of the Pratt and Letchworth steelworks in Buffalo, N.Y., to create a syndicate in May 1912 to set up Hamilton’s first steel-casting factory. Incorporated in September as the Dominion Steel Castings Company Limited, it erected a plant that winter and in 1913 merged with the recently created Hamilton Malleable Iron Company Limited to form the Dominion Steel Foundry Company. Both Canada Steel and Dominion Steel Foundry had state-of-the-art production facilities; Baillie would serve as vice-president of the latter briefly in 1916. World War I gave new scope for his entrepreneurial energy. Late in 1914 he collaborated with the owners of the Chadwick Brass Company in Hamilton to set up the large Canadian Cartridge Company Limited, of which he became president and Frank Wood vice-president. Baillie began with about 200 workers but he would eventually employ 900 to manufacture brass cartridge cases for the British government. In August 1915 he won a lucrative contract to produce two million 18-pounder cases by promising to return any profits on the second million. By reorganizing production to cut costs drastically, he was able to turn over $758,248 in a well-publicized gesture in July 1916. Other manufacturers were “very disturbed” by this move, according to Joseph Wesley Flavelle*, chairman of the Imperial Munitions Board, the agency in Canada that contracted with the British government, and none took up his example. That year Baillie also made sure that the growing discontent among Hamilton’s munitions workers did not disrupt production at either Canadian Cartridge or Burlington Steel by conceding the nine-hour day just before the outbreak of a bitter strike in most other metalworking plants in Hamilton. Baillie moved quickly to start manufacturing. He acquired the small Toronto plant of Curtiss Aeroplanes and Motors Limited, and on 26 January signed a contract for a bigger plant. To the astonishment of most observers, within ten weeks he had a new, fully equipped factory operating on six acres on Dufferin Street, in Toronto’s west-end industrial district. By November aircraft were leaving at a rate of more than 50 a week. Valued at nearly 14 million dollars, the aircraft produced were mostly slightly modified Canadian Curtiss JN-4s. (The number of JN-4s is estimated at 1,210 complete planes plus parts equal to about 1,600 more; 30 Felixstowe F-5-L flying boats were also built for the American government in 1918–19.) Baillie’s effort was remarkable. Cotton for covering wings and fuselages had to be shipped in from Trois-Rivières and Sitka spruce for frames from British Columbia’s coastal forests. Some 2,400 workers had to be assembled, ranging from skilled woodworkers and machinists to the many women needed to stitch the cotton. Although Canadian Aeroplanes was a publicly owned company, Baillie ran it like a private enterprise, and, as in his other businesses, he made it a model of highly mechanized, tightly organized mass production. It was probably the most successful of the IMB’s national factories. In fact, his costs of production dropped so far that Flavelle had to order him to cut his selling price before the end of 1917, though Baillie still made $1,000 on each plane. American aircraft manufacturers were so impressed that they brought him to Washington to provide advice and then asked him to take over the management of a plant in Buffalo, but he declined. 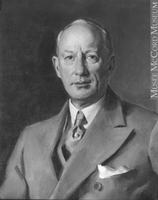 Baillie was thus one of several businessmen who, during World War I, brought the practices of corporate capitalism to the rapidly expanding state administration of economic and social life in Canada. With his steel plant in Hamilton producing steady profits, he was able to add to his record of public service by refusing to accept any remuneration for his work in aviation. On 9 Jan. 1918 he became the first Canadian to receive a knighthood of the Order of the British Empire, recently created to recognize wartime service. The manufacturing facilities he had created for the national effort were short-lived, however. When the federal government showed no interest in the postwar production of aircraft, the Toronto plant was closed some months after the armistice and sold to the Columbia Graphophone Company Limited. Although Baillie had hoped that Canadian Cartridge could produce forgings and steel barrels when munitions work ended, he had to close its plant too after the war. Despite his heavily involvement in Hamilton’s industrial life, Baillie continued to reside in Toronto. Unlike some other prominent businessmen, he showed little interest in charity, social reform, or high culture, though he had been a director of Wycliffe College and Grace Hospital in 1912. He seemed to prefer to spend his time away from business enjoying robust private pleasures in the exclusive social circles of his class. An Anglican in religion and reportedly independent in politics, he relaxed with male colleagues in several clubs in Toronto and Hamilton, and pursued his passion for outdoor sports in private golf and country clubs and in the Royal Canadian Yacht and Toronto Canoe clubs (he was a rear commodore of the latter). On his large Lisonally Farm near Oakville, he bred prize-winning Shorthorn cattle. 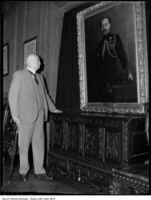 By contrast, his wife, a daughter of Aubrey White*, Ontario’s deputy minister of lands, forests, and mines, took “an active part in all forms of public-spirited work,” serving as a president of the Women’s Auxiliary of the Canadian National Institute for the Blind and as a board member of the Home for Incurable Children in Toronto. When cancer and a pulmonary embolism ended Baillie’s life abruptly in 1921, his skills and acumen as a promoter and an industrialist were widely praised. Among businessmen and politicians, he was known for facilitating the flow of capital to new industries and strengthening both the industrial base of Canada’s premier steel-making centre and the country’s wartime manufacturing capacity. The workers in his closely managed, technologically sophisticated factories might well have remembered him with mixed feelings for his contributions to a second Industrial Revolution. In all these ways, he typified the many ambitious financiers who directed their energies into the mainstream of Canada’s industrial life in the early 20th century and helped to reshape the country’s economy. AO, RG 22-305, no.42876; RG 80-5-0-276, no.1828; RG 80-8-0-800, no.1017. Dofasco Inc., Legal Services Dept. (Hamilton, Ont. ), Articles of continuance, continuing Dominion Foundries and Steel Limited as Dofasco Inc., 1979; Library Resource Centre, Letters patent, incorporating Dominion Steel Castings Company Limited, 27 Sept. 1912; Hamilton Malleable Iron Company Limited, 17 Dec. 1912; Dominion Steel Foundry Company Limited, 1 March 1913; Hamilton Steel Wheel Company Limited, 7 Nov. 1916; Dominion Foundries and Steel Limited, 15 May 1917 (microfiche).— NA, RG 31, C1, 1871, Toronto, St James’ Ward, div.7: 1. Daily Times (Hamilton), 21 Sept. 1910; 16 March, 17 Dec. 1915. Globe, 3 Jan. 1921. Hamilton Herald (Hamilton), 25 March, 21 Dec. 1914; 18 May 1915; 10 June, 26 July 1916. Hamilton Spectator (Hamilton), 21 Jan. 1919. American Iron and Steel Institute, Directory of the iron and steel works of the United States and Canada (New York), 1916: 67. Annual financial rev. (Toronto), 1916: 216. Aviation in Canada, 1917–1918: being a brief account of the work of the Royal Air Force, Canada, the aviation department of the Imperial Munitions Board, and the Canadian Aeroplanes Limited, comp. Alan Sullivan (Toronto, 1919). Michael Bliss, A Canadian millionaire: the life and business times of Sir Joseph Flavelle, bart., 1858–1939 (Toronto, 1978), 53–82, 284, 310–11, 367–68, 370, 377, 388. Canada Gazette, 8 March 1913: 3287–88. Canadian annual rev., 1913. Canadian Foundryman and Metal Industry News (Toronto), 8 (1917), no.1: 7. Canadian Machinery and Manufacturing News (Toronto), 7 (1911): 293–95; 11 (1914): 5–6; 16 (July–December 1916): 159. David Carnegie, The history of munitions supply in Canada, 1914–1918 (London, 1925). Cyclopædia of Canadian biog. (Rose and Charlesworth), vol.3. DHB, vol.2. Directory, Toronto, 1893–1921. Industrial Canada (Toronto), 13 (1912–13): 858, 1002; 14 (1913–14): 1169. Iron Age (New York), 89 (January–June 1912): 1367, 1519. Labour Gazette (Ottawa), 11 (1910–11): 404; 15 (1914–15): 1389. K. M. Molson and H. A. Taylor, Canadian aircraft since 1909 (Stittsville, Ont., 1982), 23, 227, app.2. Monetary Times (Toronto), 14 Jan. 1921. National encyclopedia of Canadian biography, ed. J. E. Middleton and W. S. Downs (2v., Toronto, 1935–37). P. E. Rider, “The Imperial Munitions Board and its relationship to government, business, and labour, 1914–1920” (phd thesis, Univ. of Toronto, 1974). H. B. Ward, “Hamilton, Ontario, as a manufacturing centre” (phd thesis, Univ. of Chicago, 1937). Who’s who in Canada, 1919–20. Women of Canada (Montreal, 1930). Craig Heron, “BAILLIE, Sir FRANK WILTON,” in Dictionary of Canadian Biography, vol. 15, University of Toronto/Université Laval, 2003–, accessed April 26, 2019, http://www.biographi.ca/en/bio/baillie_frank_wilton_15E.html.